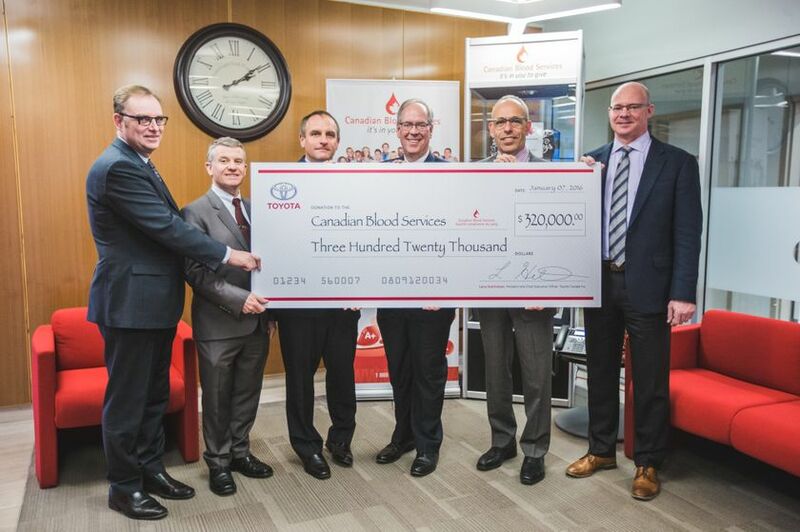 Toyota Canada and its dealers are providing $320,000 to Canadian Blood Services’ Cord Blood Bank, which collects, tests and stores blood stem cells from the umbilical cord and placenta of healthy volunteer mothers. Toyota Canada and its dealers are also donating $120,000 to Héma-Québec’s Public Mothers’ Milk Bank, which collects, tests and distributes pasteurized milk for premature babies. Canadian Blood Services is a not-for-profit charitable organization that manages the national supply of blood, blood products and stem cells for all provinces and territories (excluding Quebec). It also leads an interprovincial system for organ donation and transplantation. For many patients, a blood stem cell transplant is the last and best hope of recovery when their own stem cells or bone marrow have been damaged by chemotherapy drugs, radiation therapy or disease. The demand for stem cells is growing at a rapid pace. Canadian Blood Services operates five collection sites in four cities across Canada. When giving birth at one of these locations mothers can choose to publicly bank their baby’s cord blood. These cord blood units are stored at one of two manufacturing facilities operated by Canadian Blood Services and made available to patients in need. 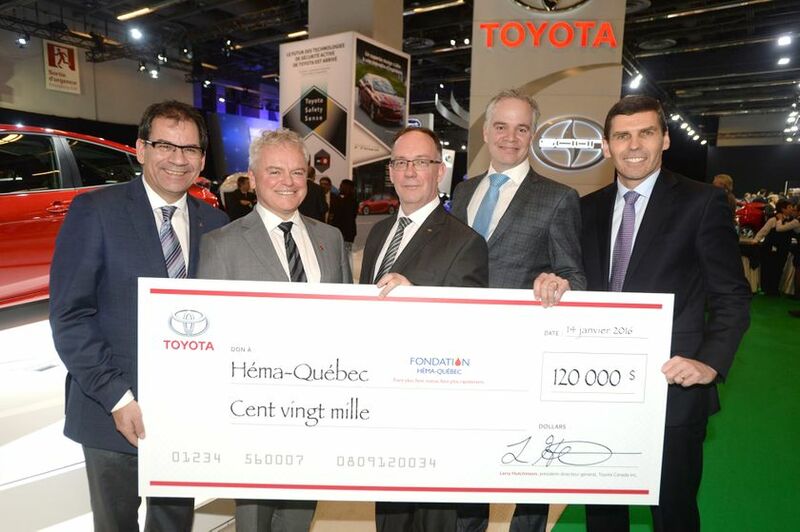 From left to right: Patrick Bérard, Executive Director, Héma Québec Foundation, Serge Maltais, President and CEO, Héma Québec, Jocelyn Daneau, Zone Manager, Quebec, Toyota Canada, Charles Saillant, General Manager, Ste-Foy Toyota Scion, Larry Hutchinson, President and CEO, Toyota Canada. Héma-Québec manages the blood supply in Québec and provides other human biological products including human tissues, umbilical cord blood and mother’s milk. It is the only provider of blood products in North America to manage a mother’s milk bank. Through the milk bank, Héma-Québec is able to supply donated milk to hospitals that provide neonatal care to premature babies born at 32 weeks’ gestation or earlier. These babies cannot be nursed by their mothers. Without access to milk from the bank, the babies would be at serious risk of necrotizing enterocolitis, a potentially life-threatening intestinal disease. “The donation to Héma-Québec’s Public Mothers’ Milk Bank will ultimately save many premature babies. We feel privileged to have the support of such an extraordinary partner, who shares our vision of excellence and innovation in health care”, declares Patrick Bérard, Executive Director of the Héma-Québec Foundation. Toyota will also be announcing an innovative collaboration with a very different organization; coming together the goal of improving the lives of Canadians through the blood supply chain in Canada. For more information on how to donate, visit www.blood.ca or http://fondation.hema-quebec.qc.ca/en/. Toyota Canada Inc. (TCI) is the exclusive Canadian distributor of Toyota, Lexus and Scion vehicles. Toyota has sold over 4.6 million vehicles in Canada through a national network of 285 Toyota, Lexus and Scion dealerships. Toyota is dedicated to bringing safety, quality, dependability and reliability in the vehicles Canadians drive and the service they receive. TCI’s head office is located in Toronto, with regional offices in Vancouver, Calgary, Montréal and Halifax and parts distribution centres in Toronto and Vancouver. Toyota operates two manufacturing facilities in Canada. Having produced more than six million vehicles, popular Canadian models built at these facilities include Toyota RAV4, Toyota Corolla, Lexus RX 350 and RX 450h hybrid. Canadian Blood Services manages the national supply of blood, blood products and stem cells, and related services for all the provinces and territories (excluding Québec). We operate an integrated, pan-Canadian service delivery model that includes leading an interprovincial system for organ donation and transplantation. Our national scope, infrastructure and governance make us unique in the Canadian healthcare landscape. Canadian Blood Services is regulated as a biologics manufacturer by Health Canada and primarily funded by the provincial and territorial ministries of health. Canadian Blood Services is a not-for-profit charitable organization.